There's a song called "Geronimo's Cadillac". (If you haven't heard it, listen to Bill Miller's version.) The song says "they put Geronimo in jail down south....where he couldn't look a gift horse in the mouth." The "gift horse" is a very powerful symbol, especially if you've seen the famous (infamous?) picture taken later in which Geronimo was ordered to pose in..you guessed it, a new Cadillac motor car. However, I think the first "Cadillac" that the U.S. presented to Geronimo and the Apache people is pictured above--a dirty, sweltering train without proper facilities for even a few people--let alone the hundreds the Army crammed onboard. Shown here, under armed guard, are Geronimo and the last free Apaches, who surrendered in Sept. 1886. The agreement with the government specified that they would have to be kept down south, away from their beloved mountains, deserts, and Warm Springs, for maybe a year, most likely, two. However, Washington had already thrown those words away before Geronimo agreed to them in good faith. Already imprisoned in inadequate facilities in the Castillo de San Marcos, St. Augustine, Florida were hundreds of non-combatants, including families who had lived peacefully under Army control, on inadequate reservations for several years. However, to punish about 32 of the last remaining warrior band, and to solve the "Apache problem," the U.S. government imprisoned every Apache it could get its hands on--including decorated calvary scouts. In all too many cases, the end result would be the lingering, blood-spitting death of consumption in the moldy, swampy, overcrowded prisons of Florida and Alabama. 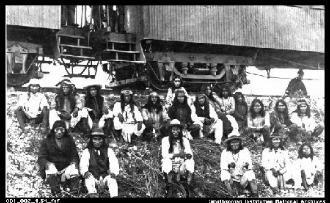 For many Apache children, still another train ride to death lay before them, as missionaries and Army officials wrestled them from the arms of their families in Florida. The children were shipped them off to Carlisle Indian School, where they also died, choking on their own blood, in appalling numbers. Records show that the largest number of graves in the school's cemetery hold the remains of Apache children. There is deadly irony in the school superintendent's oft-repeated motto "Kill the Indian, save the man" when one considers how many children died, and how many children who survived endured repeated killing blows to their spirit. Admittedly, this isn't the "pretty" history you get in school with the story of Pocahontas or the first Thanksgiving. But this story is real, very real. The photo above, and the title of this page, stand as not only the truth of Apache history, but as a symbol for suffering inflicted on Indian peoples of all tribes--usually backed by treaties or other agreements. To date, not one treaty has been kept by the government that wrote it and demanded acquiescence, often through starvation or massacre. In many cases, such as the agreement that led Geronimo to agree to come in for the last time, the treaty was broken by the time the words were spoken. In essence, government negotiators demanded good faith from Indians while the U.S. threw their words away as as soon as they took breath, leaving only ever-diminishing echoes on the winds. As you explore the complex world of issues in Indian Territory, keep in mind that treaty history is one of the major tools required to understand the struggles and challenges of the more than 500 Indian nations in the U.S. The histories of America's First Nations and First Peoples have been inexorably shaped by not only the relentless, bloodstained massacres, incursions, battles, and imprisonments that marked the path of this land's self-described "discoverers," but also by the more insidious warfare of fraudulent and duplicitous treaties. Re-learning history through the eyes and hearts of those who, under the gun and, all too often, starving, made treaties in good faith and were cheated, is essential for those who would visit Indian Territory with any degree of knowledge or understanding. Links to factual, historical, and thought-provoking sites will continue to be added. The historical threads that weave treaty enforcement and the almost-daily emergence of new legal challenges to the sovereignty and cultural rights of Indians creates a living pattern of a people's fight to survive as themselves. In Indian Territory, treatys, regardless of their date, are all "current business." for quality, accuracy of content, presentation and usability." The music on this page is "The Spirit Blues." to Julia White's inaccurate portrayals of Lozen and Apache women. Please remember that this essay, like all Warm Springs Productions original material, is copyright, 1997, 1998, 1999, by Patricia Phillips, Warm Springs Productions, Inc.